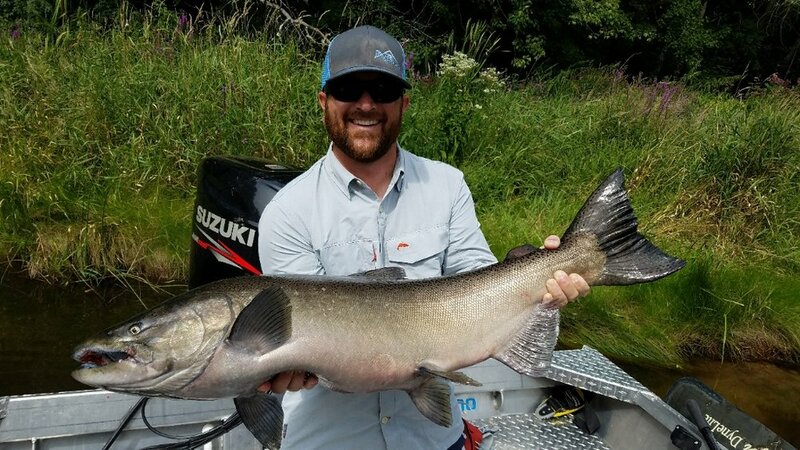 Chinook Salmon aka King Salmon are known for their sheer power and speed, Michigan still has some of these fish in rivers that we guide on such as the Pere Marquette and Big Manistee. These fish usually average around 15-20lbs with some fish up to 35lbs mixed in. They will definitely surprise you with their power when they try to take the rod out of your hand as they smash your crankbait. We usually start targeting these fish in the Michigan rivers in mid to late August depending on the weather and continue to fish them into mid to late October. There are opportunities to get into these fish earlier in some of the smaller rivers such as the Little Manistee and Betsie. The early run King Salmon might not be as numerous at times but when you hook into one they are some real tackle busting brutes. They can snap premium lures in half and break heavy lines with ease. The peak time for the King Salmon in the Pere Marquette, Big Manistee, and Muskegon is mid to late September. Anytime that we get a cold front and some rain come late summer/fall, these fish will be triggered to come into our West Michigan Rivers. When fishing for King Salmon in the river we will usually switch off throughout the day between fishing crankbaits and float fishing with bobbers and eggs. Both methods are very effective and will get you into fish. Other methods that we use and that can be very effective are dropping back plugs, back bouncing eggs, and fly fishing. For the King Salmon we usually start the season off by targeting the lower ends of the Pere Marquette and Big Manistee rivers. Later on in the run we will offer charters on the Muskegon River, the Grand River, and White River as well.